Our horseback riding adventure and our visit to the Petroglyphs had been a great way to get a feel for a truly Mexican landscape. When we arrived back at the corral after our ride, Santiago showed us how Lucero, the white horse I had been riding on, can dance. Obeying Santiago’s instructions, Lucero willingly complied and performed a graceful little trotting routine for us. Up on the hill were the stables where we got to see all the other horses that live here as well as a small flock of sheep. Of course, Jesse, the Mexican Crocodile Hunter, was right out there in the corral, running out to the sheep and chasing a tiny lamb. He quickly caught this one-week old baby lamb. 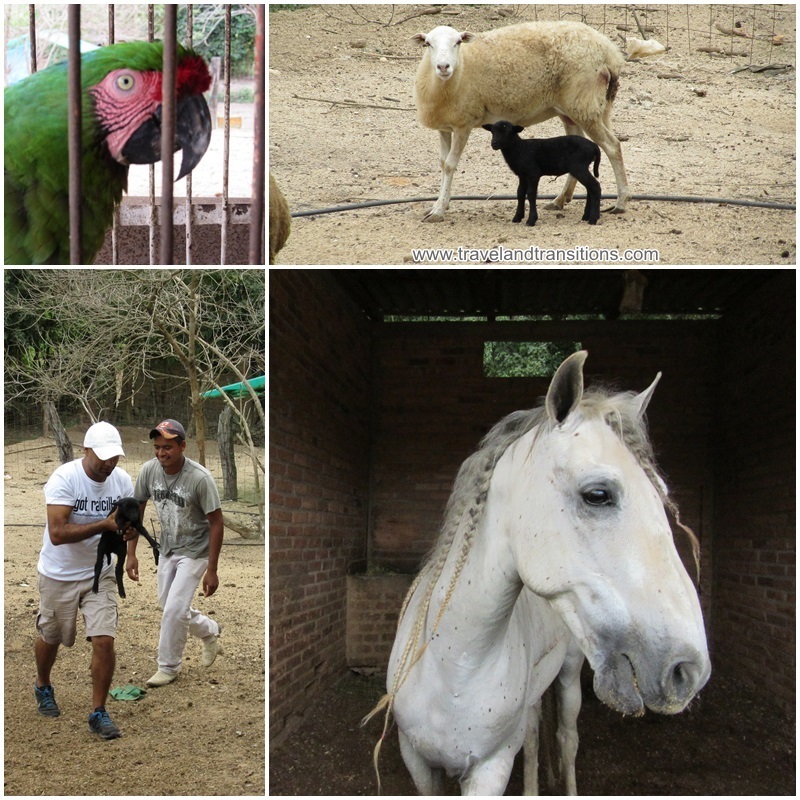 A big green parrot with a red face was sitting there in a cage watching us, and one of the young cowbows at the Hacienda El Divisadero was making some rhythmic noises. Sure enough, the big bird started to nod up and down along to the beat. It didn’t do so well when Jesse produced his imitation hip-hop beat. With all this nature and all the animals, anyone who enjoys a rustic Mexican experience will surely feel right at home at Hacienda El Divisadero. 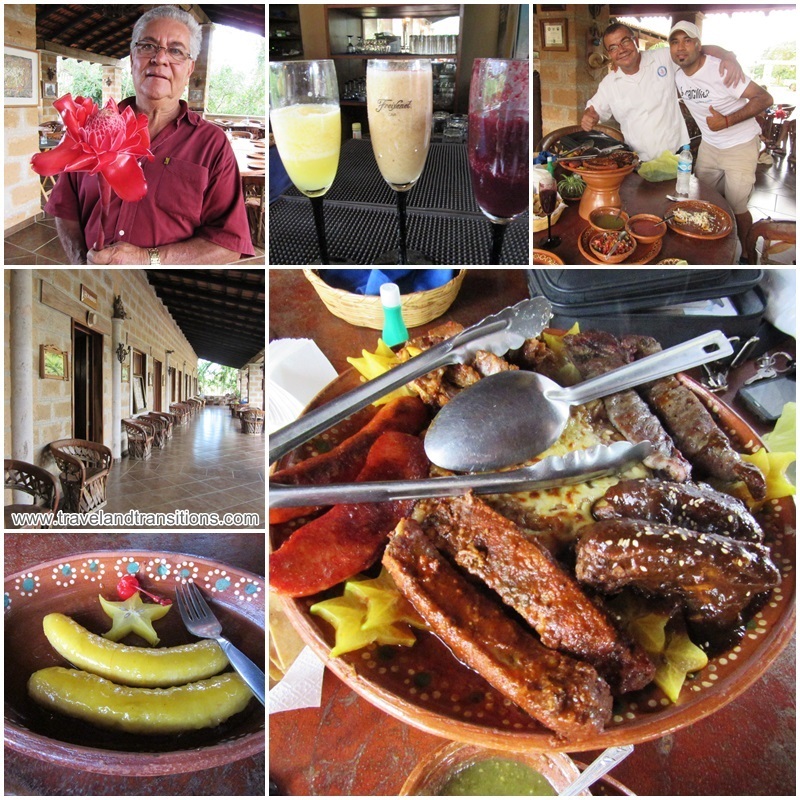 After this exciting back-country adventure we walked back to the restaurant at La Hacienda El Divisadero and Don Tino, the owner, had prepared three different types of margueritas from local guava, black berries and passion fruit. I am not usually much of a drinker, but these three colourful drinks were delicious. Each marguerita was sprinkled with a bit of “tajin”, a Mexican seasoning that is made from chile peppers, lime and salt, which gives the drink a little bit of extra kick. Then we sat down for dinner and Manuel arrived with a huge platter of traditional meat dishes from different parts of Mexico. Jesse explained the big spread: Chicken Mole from Puebla, Birria (pork chops) from Guadalajara, Chorizo sausage from Toluca, Borrego – lamb raised right here on the hacienda, and Arrachera, black Angus beef from Sonora. The table was a true meat eaters’ delight. In the center there was a pot of refried beans with melted Queso Oaxaca on the top, accompanied by hand-pressed tortillas. Finally, after all this bounty, dessert arrived in the form of honey-fried bananas that were decorated with star fruit – absolutely delicious! This dinner was the crowning touch of the authentic Mexican experience at Hacienda El Divisadero. By about six in the evening Jesse and I said goodbye to our friends at the Hacienda El Divisadero and then we were on our way back to Puerto Vallarta. As the sun was starting to set we stopped several times, first to look at the famous “Los Arcos” rock formations, off the coast of Mismaloya. Then, just up the road, we parked the car and walked to the beach down a steep embankment. From there we had an amazing view of the closest rock of Los Arcos. A family had been picnicking down here, and just where the sandy beach started there was a grave with a cross dedicated to a certain Tovar Garcia. 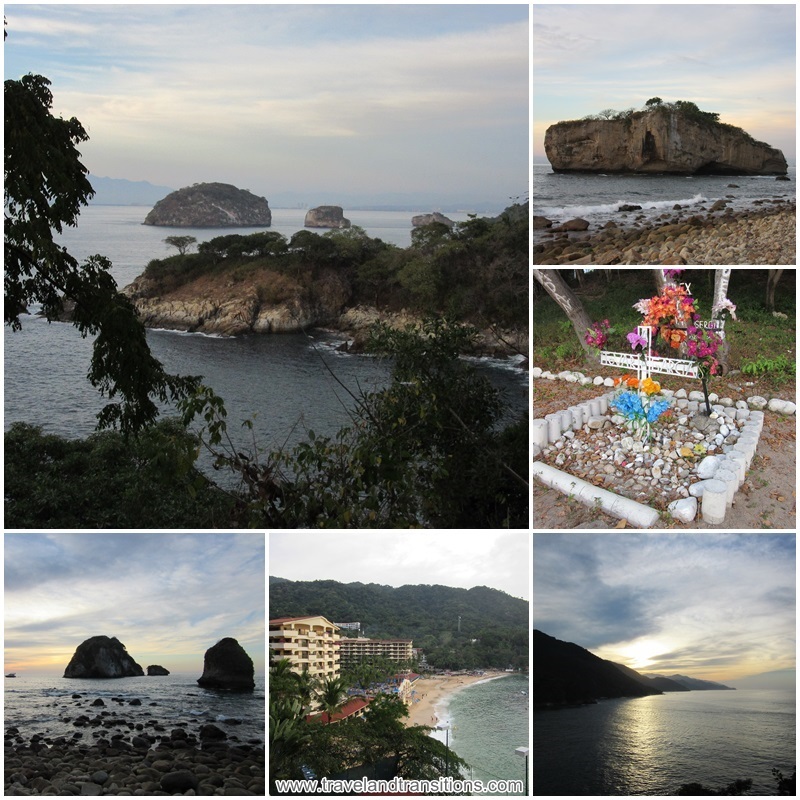 I felt I had come across a really special hidden place here on the coastline of Banderas Bay. 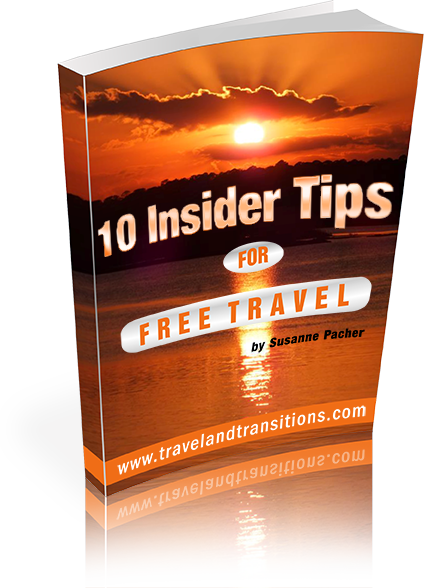 Without my expert guide Jesse I would have never found this place and I would have never had such a wonderful authentically Mexican experience as on this day in the town of El Tuito and at the Hacienda El Divisadero.